The video, posted on Instagram and YouTube by See Through Canoe, has collected quite a few reactions. Someone's day out on a canoe in Florida turned into the stuff of nightmares, all thanks to a huge alligator. 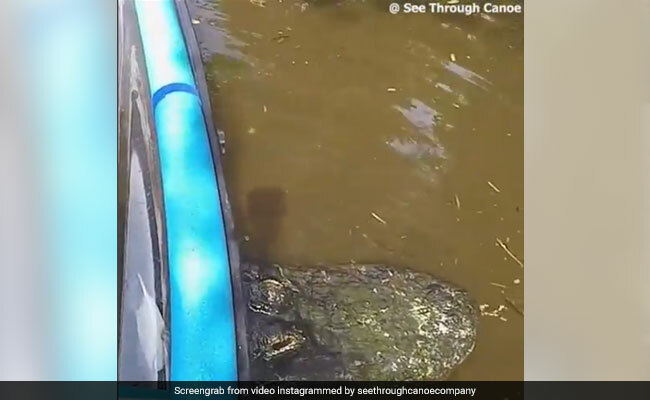 A video circulating online shows the frightening moment a see-through canoe gets stuck on something in murky water and it turns out to be an extremely huge alligator. The video has been shared on Instagram and YouTube by See Through Canoe. "That moment when you realize your canoe is stuck on an alligators back," says the caption. The video, just a few seconds long, shows the moment the canoe hits something in the water and comes to a halt. Seconds later you see an alligator emerge from below the canoe. The stuff of nightmares, right? According to the YouTube description of the video, the person on the canoe couldn't do much in that situation except wait. "When the gator finally backed up and submerged, the canoe moved with him for a few feet before he went down," it says on YouTube. "Oh hell no," says one Instagram user on the video. "I would be dead right now," says another. "My WORST nightmare!" says a third. "I'd initially have been terrified seeing this HUGE alligator head coming out from under the boat. That's a MONSTER!" says a comment. How would you react in this situation? Tell us using the comments section below.